You've found the smartest way to book last minute vacations to Puerto Rico. Click a price below to see our unique vacation grid. It's very fast and has a calendar format for easy comparison. Our agents have been to most resorts - call us and we'll help you decide which hotel is right for you. Make your dreams a reality with our last minute vacations to Puerto Rico. Full of natural beauty, Puerto Rico is inspiring. Experience interesting marine life, bird-watch in the wild, admire the coral reefs and limestone caves with catamaran or snorkeling adventure, and take in the calming scene of lush forests. You’ll also find modern influences of museums, art galleries, shops, and casinos mixed with colonial architecture, street parties, and salsa music. Our last minute vacations to Puerto Rico place you in San Juan, an eclectic city with old neighbourhoods and restored buildings. Explore history and culture as well as stunning beaches and sunny skies. 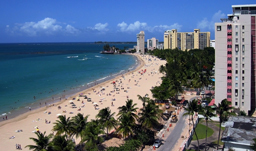 Opt for a hotel like La Concha Renaissance Resort or Sheraton Old San Juan Hotel. Our travel agents can recommend things to do and places to stay. Call them toll-free at 1-800-665-4981 to learn more.